Gomer Kiddy-Oke, the best in Great Kid Fun! Come support a local school – but mostly, come and experience the Gomers Kiddy-oke!! The Gomers are AMAZING with the kids and the kids super dig being on stage and having the band rock them out to Twinkle Twinkle Little Star. So whether or you are looking to make a star out of your child or just for an awesome evening of entertainment that you and your kids will enjoy, come on out! 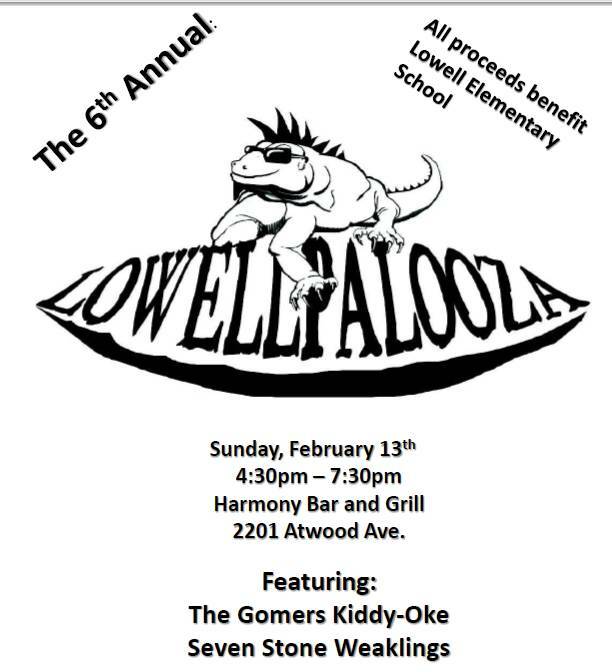 Lowellpalooza is Lowell’s 6th annual fundraising benefit for the school in a non-school space. The Harmony Bar & Grill, a long-established neighborhood eatery and music venue, has graciously offered to let Lowell accept 100% of the cover charge for this event. Lowellpalooza will merge parents and teachers and caregivers and staff and community supporters into one large, music-happy crowd. It’s a great, fun event. See what the Isthmus had to say about previous Lowellpaloozas! Here is a chance for our kids to be rock stars! Join the Gomers on stage and sing your favorite songs to a crowd of adoring fans! You’ve never seen karaoke like this before! Adult tickets are $10 if you buy them before the event on Sunday, or $12 at the door. Children under fifteen are $5 in advance and at the door. Children under 5 are free.